I’ve read some remarkable short story collections this year: Théodora Armstrong’s Clear Skies, No Wind, 100% Visibility, Ayelet Tsabari’s The Best Place on Earth, Saleema Nawaz’s Mother Superior, Richard van Camp’s Godless But Loyal to Heaven, Miranda Hill’s Sleeping Funny, and Paul Headrick’s The Doctrine of Affections. Three more collections have captured my attention in recent weeks: Rosemary Nixon’s Are You Ready to Be Lucky?, Elisabeth de Mariaffi’s How to Get Along with Women, and Shaena Lambert’s Oh, My Darling. Each of these writers possesses a distinct style, so despite some overlapping themes (shifting identities and betrayals, loss and memory, epiphanies and disappointments), the collections cast a particular light on the stories and characters therein. A rotten trick, perhaps, not to pull this bit from Rosemary Nixon’s Are You Ready to Be Lucky? (instead, pulling from her novel Kalila). But it raises a pertinent question indeed. One to which there are as many different answers as there are readers for stories. For each reader has different expectations of what a story should do, of where a story is meant to lead. In Are You Ready to be Lucky? readers meet Rosalyn in the first story, when she is headed to Stella’s New Year’s party. First, note the specificity. Not only can readers traipse the streets of Calgary with Rosalyn, even buy the same books if they so choose, recall the taste of canned gravy, but they can intuit a great deal about her based on the details shared. The description of the gifts adds a quiet Barbara-Pym-ish kind of precision to readers’ understanding of this character, even as Roslyn’s high-stepping sets this contemporary story in motion with a sharp, no-nonsense tone. Part of the energy in this title story is Roslyn’s, but part is simply Rosemary Nixon’s deft use of language. Dialogue is used liberally and credibly, so that even the Rosyln-less stories feel as though the prose itself is high-stepping. Roslyn is an outstanding character; in only thirty pages, readers will find themselves crossing their fingers for her, understanding that she is, indeed, ready to be lucky. And, so, it’s with great satisfaction that readers realize, with the second story, that the stories in this collection are linked, so that readers can follow her “fortunes” for awhile longer (although from a distance). The linking in Rosemary Nixon’s collection is handled deftly. Time passes naturally, and there is a sense that, at any moment, the focus might shift to another perspective, without severing the pre-existing ties. If one imagines all the stories in Are You Ready to Be Lucky? in a single room, it is well and warmly lit, with a amber-glow spotlight gripped in a steady hand to guide readers’ attentions. Contents of Rosemary Nixon’s Are You Ready to Be Lucky? If one imagines all the stories in Elisabeth de Mariaffi’s How to Get Along with Women standing together, they are backlit by a mid-day sun, many of the figures only visible as outlines, the glare keeping you at a distance. She wants to do something nobody else is doing, that’s the person she wants to be. 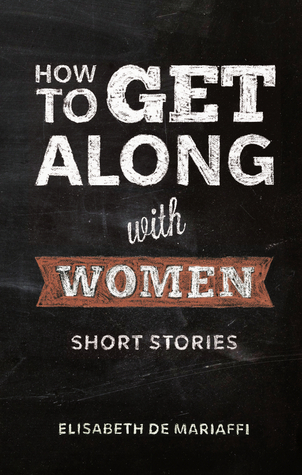 Whether readers find the stories in How to Get along with Women unique will depend how much short fiction they read. Certainly the themes are familiar. The author views the overarching theme of the collection as power: power as expressed through relationships — all kinds of relationships; power structures involved are fascinating to her. Thematically, that observation recalls the short stories in Lynn Coady’s Play the Monster Blind, Alice Munro’s The Progress of Love, Britt Holstrom’s “Leaving Berlin”, Heather Birrell’s “BriannaSusannaAlana”. But stylistically, How to Get Along with Women feels closer to the fiction of Daniel Griffin, Matthew Firth or Darryl Joel Berger. Matter-of-fact, unadorned prose. The dialogue meshing with narrative, all-of-a-piece. Elisabeth de Mariaffi is standing solidly outside the stories she tells; it is as though she records and displays the events therein and leaves the reader to colour in the outlines. 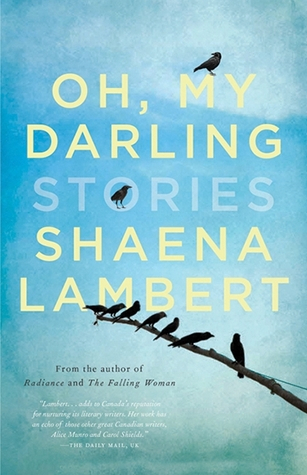 Were the stories in Shaena Lambert’s Oh, My Darling to share room, each would aim to hang a differently coloured scarf atop the lamp nearest them, but cast a shadow as notable as the bright swatch of cloth. These are beautifully crafted stories, and their settings and preoccupations vary substantially, as though written over the course of many years, with great attention paid to each word. They are, relatively speaking, short (the entire collection is under 200 pages long and the margins are generous and the typeface welcoming). But each seems to reach more widely than the story’s length suggests. These are the kind of stories that linger afterwards. Even characterizations are sometimes afforded in short, but surprisingly effective, bursts. Many of the characters in in mid- or later-life, and their stories appear to be told in such a way that the teller too has lived a great deal, endured and survived, struggled and triumphed. The stories feel quintessentially Canadian in a traditional way without feeling old-fashioned; some might use the word ‘classic’ to describe the style. There is a lyricism to the prose, which lightens the weight of the subject matter. And the phrasing reveals the attention paid at the sentence-level in the crafting. In the stack of stories to come? Katie Boland’s Eat Your Heart Out (2013); C.P. Boyko’s Psychology and Other Stories (2012); Anne DeGrace’s Flying with Amelia (2012); Douglas Glover’s Savage Love (2013); Jerry Levy’s Urban Legend (2013); Samuel Thomas Martin’s This Ramshackle Tabernacle (2012); Nadine McInnis’ Blood Secrets (2012) and an anthology edited by Andrew Atkinson and Mark Harris Running the Whale’s Back: Stories of Faith and Doubt from Atlantic Canada (2013). Have you read any of these collections? Or, are they on your TBR list?